Posted under Library, Technology on Thursday, January 24th, 2008 at 3:37 pm, by Brian Herzog. Post and comments available via the RSS 2.0 feed. Both comments and pings are currently closed. Actually, I think libraries could really have fun with this. The Kindle already has a feature where you can keep a book for 3(?) days and “return” it by deleting and not getting charged for it. A library could work a deal where they loan a book out and it’s automatically deleted after 3 weeks unless renewed. Basically, it could be a virtual library where the book is removed after X number of days. I believe the idea of a Kindle device becoming ubiquitous is inevitable. The only question is, when will it happen and will it be this device or the 2nd or 3rd generation of this device? 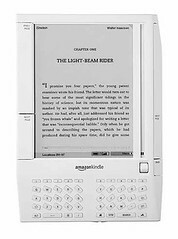 Another really good take on the Kindle was the review by Walt Mossberg in the WSJ. I think the problem with libraries and Kindles is the cost – buying one won’t be enough to fulfill patron interest/needs, but buying a bunch might be too expensive. Plus, if we did buy books for them, I think each copy can only go on one Kindle – which means either we’d have to buy multiple copies of books for each device, or else you know the two most popular titles would end up on the same Kindle, causing everyone would wait for that one device. And Lee might be right – it’s not that I’m poo-pooing all ebook readers; I just don’t think the model is quite right yet for libraries. For it to really work, the device would have to be separate from the book: a patron would check out a (cheap) device, and then be able to download whatever title(s) they wanted to it from our (vast) ebook library – while at the same time other patrons could access the same books. Not to mention that any ebook device should not only display the text (in variable font size), but also be able to read it out loud to you, too – ebook and audio book in one. Yes, that’s what I’m waiting for. See I guess I was thinking about this a little differently. I was thinking the patron supplies the Kindle and the library supplies the Kindle Book server. Cuyahoga County libraries in Ohio does something similar with PDFs if you have a valid library card. I can download a time locked PDF which only works on my computer. No hardware costs of theft worries for the library in that case. Ohh… well, that certainly is a good idea, which did not at all occur to me. The model of providing certain media types for patrons to use on their own devices is one libraries understand – we loan lots of XBOX, PS2, and other games, DVD and VHS videos, as well as downloadable audio books. So just providing access to Kindle files is realistic, and more plausible than lending the devices. But I think I read somewhere that Kindle files are non-transferable – once they’re downloaded to a device, they’re only good on that device. It’d be great if Amazon opened up a service of this kind of libraries, like NetLibrary and others do. So, in this case, like so many others, it all comes down to the vendor creating DRM policies that allow for library use – which is rarely the case.